In a rollover accident, a certain amount of roof crush or roof collapse is natural. The problem is the roof crush or roof pillar collapse on too many vehicles, especially with SUVs & Light Trucks; the roof crush can be severe. The more roof crush, the more catastrophic injuries paralysis and deaths. Roof crush is the direct result of an energy assault or over compression of the roof supports from the energy stored up and released in a rollover. In passenger cars, NHTSA requires the vehicle to withstand a certain amount of direct force before the roof collapses. This same roof strength test was never required for most of the trucks on the highways today. In fact most SUVs and trucks if dropped upside down only 1.5 feet will have its roof crush down severely to the point that any occupant would experience severe and catastrophic head and spinal cord injuries. When a severe roof crush happen the seat belted driver or passenger often are trapped by the crushing roof, causing bursting fractures of the vertebra, spinal cord damage and major head injuries as well. In some severe roof collapse cases, the roof crush actually can prevent the person from breathing when their head and upper body gets trapped or crushed between the seat and the roof. When this happens the person suffocates to death. This roof crush is caused when the vehicle is inverted and begins its downward path / crush of the vehicle and its center of gravity into the roadway or the ground and the roof is contacted and therefore crushed. At that moment the roof pillars, roof headers and door frames start to crush and collapse. In this roof crush picture here you can clearly see the severe roof crush to this pickup truck. The roof strength to body / truck weight ratio was just too severe to withstand the roof crush forces and energy transferred during this rollover induced crush. The severity of this roof crush could have been lessened by stronger roof supports and a thicker gauge of metal used in the roof pillars, roof header and rails. 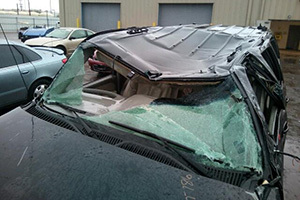 Severe roof rush is preventable if the manufacturers would design a vehicle to withstand the crushing forces of a rollover. 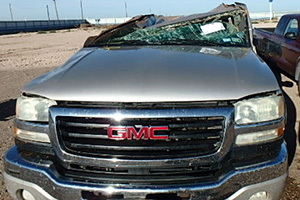 If you or a member of your family has been involved in a SUV rollover accident, van rollover, truck rollover with a severe roof crush, roof pillar collapse failure or any other serious accident or failure and you have questions about whether the vehicle or roof design may caused or contributed to the roof crush, accident or injuries, then call us now. Mr. Willis is a Board Certified Personal Injury Attorney with over 30 years of product liability and Rollover litigation experience. Call the Willis Law Firm at 1-800-883-9858 for a Free & Confidential Consultation.